05/Jun/2012 – Has demand from hotel chains gone up in smoke? Is the District Council’s tourism strategy emerging or submerging? The District Council’s plans for tourism have faced a number of headwinds over the last 18 months. The weak economy and the European debt crises have eroded confidence and made tenants more cautious. Some argue that a more sober assessment has forced all parties to adopt a more realistic attitude to the prospects for our City centre. 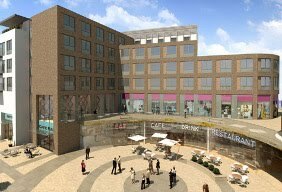 Jan/12 – S Harrison confirm that the new Friarsgate design does not include a hotel. 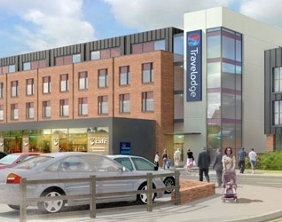 Feb/12 – Financial Times report that bondholders are poised to take control of Travelodge[£]. 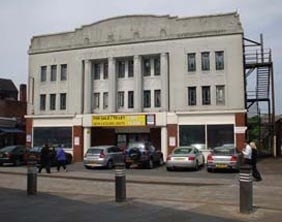 May/12 – S Harrison announce that Premier Inn will now operate the Friary Outer hotel, not Travelodge. A new planning application will be submitted to permit the site to be developed in two phases.. Lets encourage high density homes, close to the City centre. Over the last 10 years high streets have lost 1% of retail spending every year. This trend is likely to continue. Lets put people back into our City centre and stop measuring success by the floor space of sites with planning permission. Aug/09: 60 bed hotel on ex Kwik Save site?